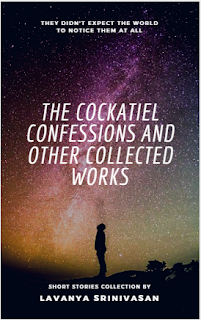 I was in a bit of a quandary, how to review Lavanya Srinivasan's eBook THE COCKATIEL CONFESSIONS AND OTHER COLLECTED WORKS. I did not want my review to be long and elaborate. I am not a professional book reviewer but this book has a number of tales, quiet a few of which struck a deep chord in me. I finally decided to go with a rather elaborate review because I felt I could not do full justice to the book as a reviewer without being detailed. I decided to rate some of the tales individually, and then come up with an overall rating. Professional book reviewers, please do forgive me if this is a totally incorrect way to review a book. I am rating the tales out of five. So here goes. 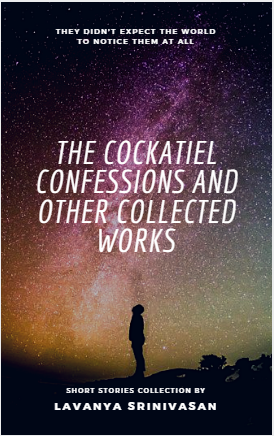 CONFESSIONS OF A COCKATIEL: This is a simply masterly read. I loved every word of it. It is a tale told by a Cockatiel in the first person when it is sold to a couple of human beings. The owners of the Cockatiel are named chirp and chirp-chirp, such funny names, but perfectly sensible from the point of view of a bird that is sold to humans. The Cockatiel refers to a laptop as 'Lahhhhuppptop'. The tale is really humorous and shows what a remarkable imagination the author has. There is even a fight with a crow included. I go with a 6/5 (yes, that is right, a six out of five - remember the old days when we used to get 102/100 in Maths) for this story. GANPATI BAPPA MORYA! - This tale is about the Ganesh Chaturthi festival in Mumbai. I have seen the grand Ganesh Chathurthi festival only in movies. I have never been part of that exciting crowd nor seen the picturesque idols of Ganpati in real life. As I read this short tale I was reminded of appu (an elephant, somewhat like Ganesha) which was the mascot for the 1982 Asiad held in India. I was going through pleasant memories and was feeling extremely happy when suddenly everything blew up on my face when I read the last line. And I guess that was exactly the effect the author had sought to create. Rating - 5/5. There were several other tales included but I am not rating all of them here. All in all, I loved almost all the tales except a few. Lavanya has also included excerpts from her books. Of the two that she has included I liked the excerpt from 'THE AWAKENING (MAYA & THE MIND MYSTICS)'. I intend to place an order for it soon. The book is an excellent read. If you are fond of short stories you can spend a happy afternoon on a Sunday cuddled up with this book. The book can be freely downloaded here. Thanks Jai for that honest and refreshing review!